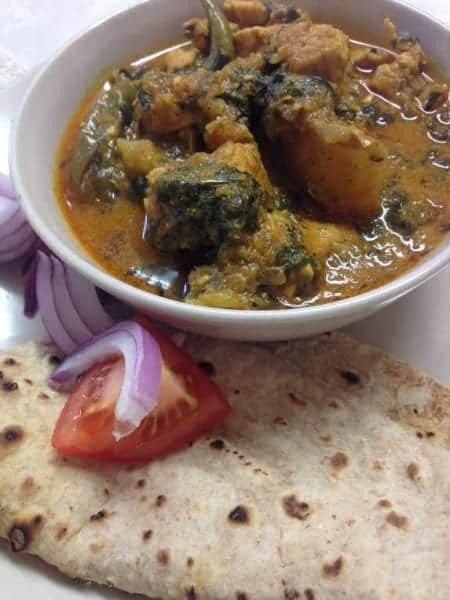 As the weather begins to cool, try out this hearty and spicy Punjabi chicken and spinach curry recipe. Disclaimer: Aromas from cooking this dish may result in random hungry neighbours knocking at your door (answer at your own risk). When they turn slightly golden, add the garam masala, paprika and turmeric powder and mix well. Now add the chopped tomatoes and tomato puree and mash into the masala. Using a food processor, grind together the spinach and green chilli. Now add this paste to the chicken masala. Serve hot with delicious chapatis. Enjoy!